I won’t complete the line from Risky Business for you (although I’m sure Ryan would love to, seeing as he once listed “cursing” as one of his hobbies). Life with a child on the autism spectrum is guided by schedules. By routines. By rules. Altering or violating any of them is often asking for trouble. On Sunday, we never really considered a spontaneous trip to Washington because spontaneity doesn’t work for our family. Last week we skipped a Devils playoff game on Tuesday because keeping Ryan up well past his bedtime early in the school week was risky. We went on Thursday night instead, knowing we could always keep him home Friday if there were any real issues. But this is the playoffs. You gotta play hurt. With the Devils facing elimination in Game 6 last night, we had to be there. This despite it being Tuesday. Despite a later-than-usual start time for TV. Despite both Veronica and I having important work days Wednesday — meaning there would be no “mental health” day if things went haywire. Yes, I put Ryan’s sleep routine ahead of the desire to see Riley’s favorite team (and Ryan’s second- or third-favorite, depending on the day) avoid elimination. Things started off well enough. 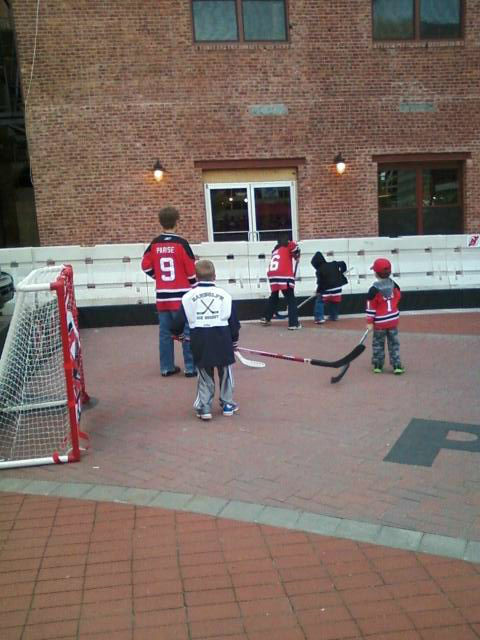 The kids played street hockey on the plaza outside the arena. Riley got her hair painted Devils red. At puck drop, the arena was as loud as I’ve ever heard it — a noticeable increase from Game 4 last week. Both kids screamed enthusiastically along with the crowd. Riley got on the Jumbotron. Again. That’s at least six times for her. Just ask her. Ryan made friends with the drunkest, most profane, obnoxious fans in our section. The ones who would miss much of the third period, presumably because they were puking in the men’s room. Between laughs, Veronica told Ryan she hoped he wouldn’t grow up to be like those fans. “Oh I will!” he told her. There were high fives from strangers aplenty. The Devils skated circles around the Panthers for two periods, yet somehow allowed a 2-0 lead to slip away. As the horn sounded to end regulation, Veronica and I exchanged a quick conversation. If the kids wanted to leave, we would head for the exits. I figured Ryan might because it was already 10 p.m. and he likes to be in bed before 9. But no. Not on this night. He was having too much fun. Riley also agreed to stay, but she was in far worse shape. During the intermission before overtime, she began to sob. Her favorite player is Devils goalie Martin Brodeur. He’s one of the best of all time. He holds every major career goaltending record. He’s won three Stanley Cups with New Jersey. But he’s also 39 and doesn’t have a contract for next year. Add it all up and if Marty allowed the next goal in this game, we might be watching him skate off the ice for the last time, and Riley knew it. Her nerves overwhelmed her. To which someone else in line answered “THEY’RE NOT GONNA SCORE THE NEXT GOAL!!! 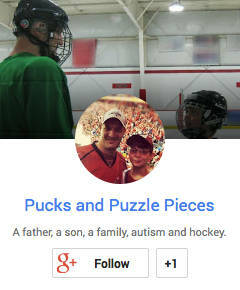 !” To which someone else replied “I BLAME THE KID’S DAD!!! !” for hearing a child even question whether the home team would win. That led to much of the men’s room chanting “LOUSY FATHER! (clap clap clapclapclap). Ryan loved it. He was trying to tell everyone in line that the dad they were mocking was HIS. He then tried his own brand of trash talk, as only he can. This ended the chanting. I smiled and laughed as we headed back to our seats for overtime. The tension was overwhelming. This time it was worse for the parents. We knew that a loss would mean carrying one sobbing and one very angry kid out of the arena. If you’re a sports fan but not a hockey fan, there is no better introduction to the sport than to watch a playoff overtime game. On TV, the drama is incredible, especially in an elimination game, as this was. In person? It’s indescribable. It’s agonizing. But if your team wins? It’s pure joy. I’m not a good enough writer to tell you how it feels to spontaneously celebrate something with 18,000 people. It has to be experienced to be understood. Five minutes into OT, Florida almost scored at one end. 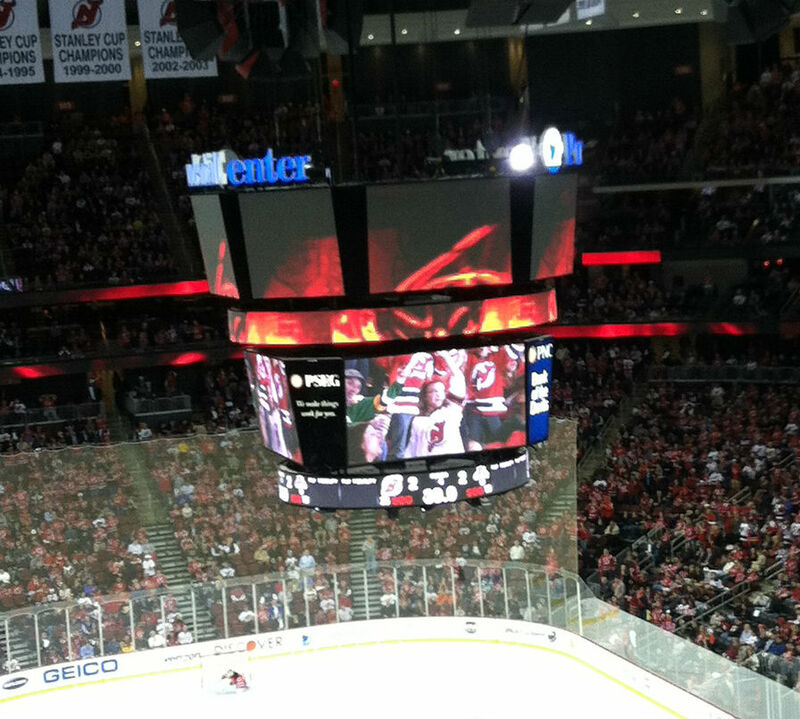 Before we had time to exhale, Travis Zajac scored at the other end, and the building exploded. High fives with strangers became hugs with strangers. We had done it. We kept the kids out late on a Tuesday night and risked massive disappointment. We stayed for OT. We dodged the bullet. Yes, we endured a mini-meltdown right after the game when I had to go back to retrieve a lost item, forcing Ryan to wait for two minutes. You know what? I’d do it again. Sometimes you just gotta say, “what the” [ask Ryan]. 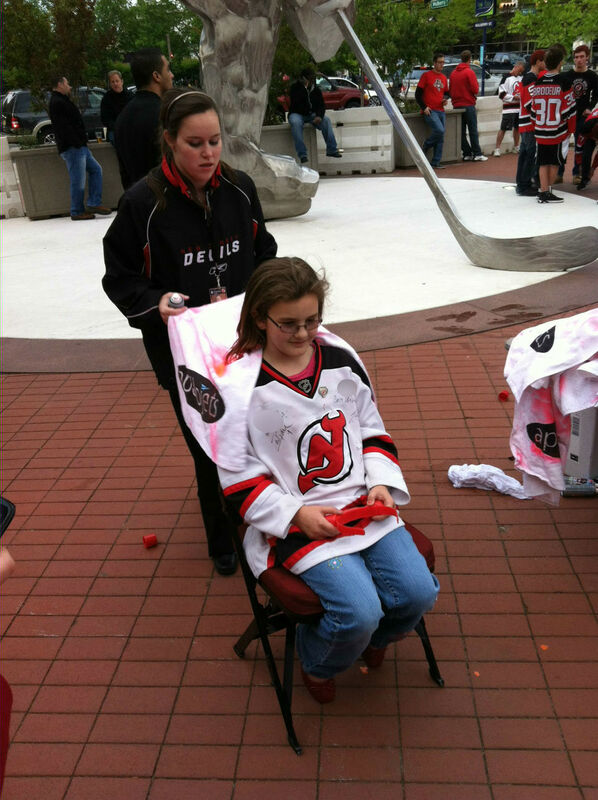 Riley gets her hair painted Devils red before Game 6. 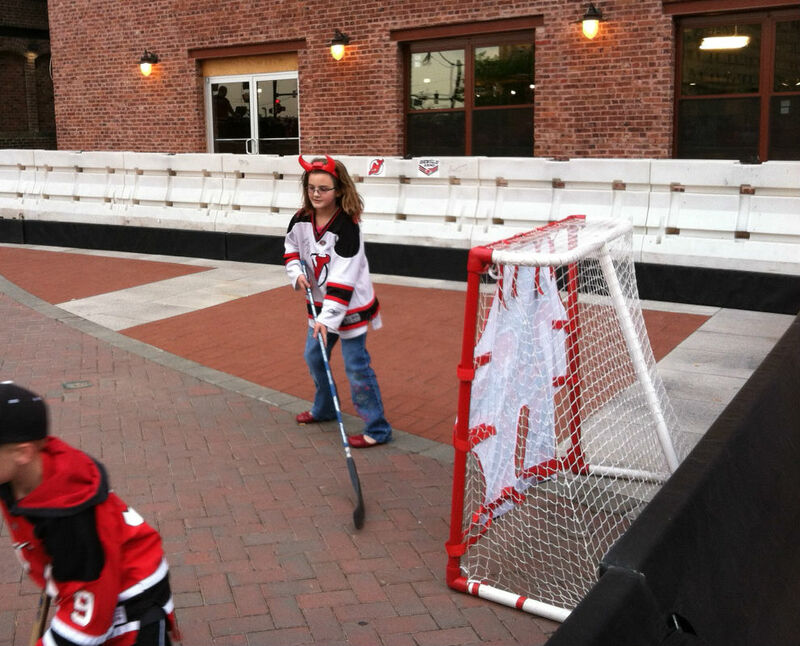 Riley plays street hockey outside the arena. Riley makes her sixth appearance on the Jumbotron -- and second of the night! Pretty Cool when you son’s got your back! Those are moments you can’t pay for and will forever hold in your heart. Unfortunately, you must prepare the kids for the Devils exit from the playoffs because they are going DOWN against the FLYERS ! CJ will be watching the game in his Flyers gear- Jersey and goalie equipment, hockey net in the livingroom and several more scratches on my hardwood floor as he races for the net doing his own play by play. Enjoy the Playoffs !!!! Hah — the Flyer fans have spoken! I think Game 1 was Devils opportunity to steal on in Philly. They needed to jump on the Flyers when they were asleep in the first period. Still think this will be a long series though, Flyers goaltending is too shaky. Tell CJ they need to bring back Leighton!